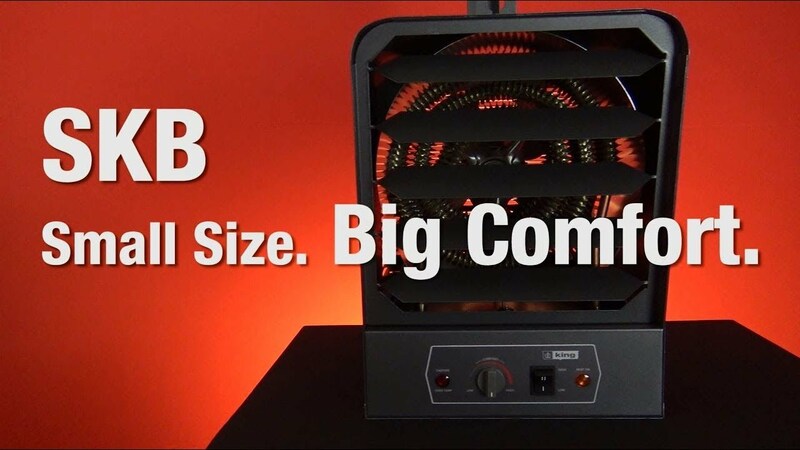 The SKB compact heavy duty unit heater is designed for use as primary or supplemental heat sources in large or exposed areas, including commercial stores, workshops, barns, storage shed and garages to prevent freezing. 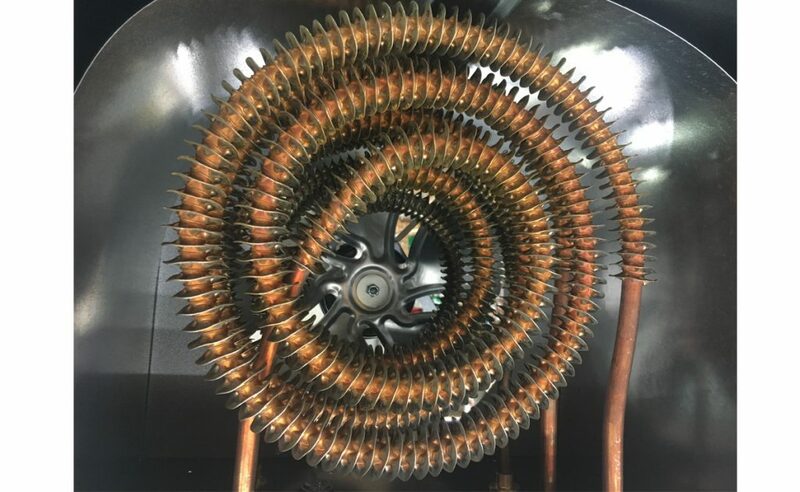 Spiral finned steel elements and high air volume (CFM) ensure efficient heat exchange producing cooler element operation, prolonging heater life. 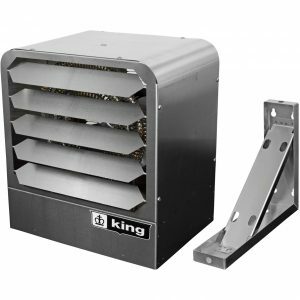 By combining the highest quality components with a dynamically balanced fan blade, the SKB unit heater will provide years of trouble-free service. Includes both a power on indicating light and a red caution light that comes on if the heater stops due to the over temperature limit tripping. 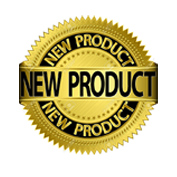 A universal wall/ceiling bracket provides for quick and simple installation. The built-in thermostat turns the heater on and off to maintain the desired room temperature or a remote wall thermostat can be used. The heater is prewired to easily convert from the built-in thermostat to a wall mounted line voltage thermostat. 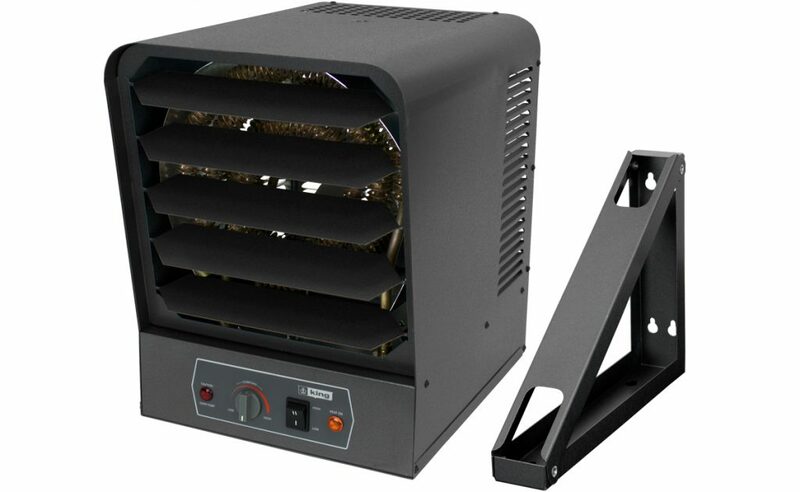 The heater can also be controlled by purchasing a transformer relay to operate a remote 24V wall thermostat. 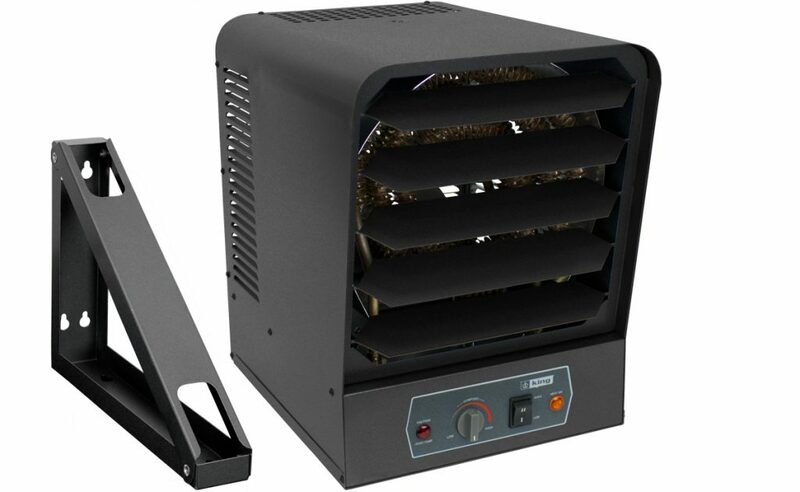 * Dual rated heaters will draw 13% less amps and 25% less wattage when operated at 208V. 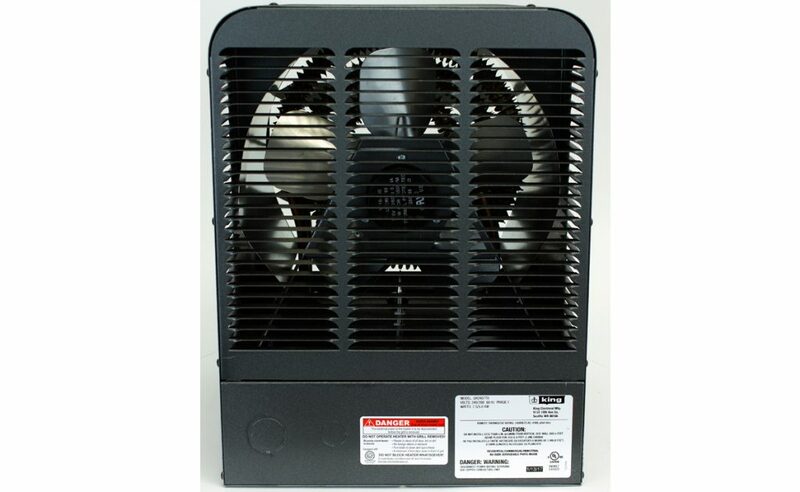 High Low switch & fan delay not available in 5kW unit. 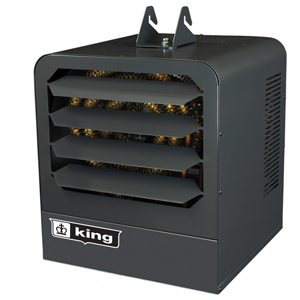 Contractor shall supply and install SKB Series unit heaters manufactured by King Electrical Mfg. Company. Adjustable Outlet Louver: Louvers direct air up or down as needed. Red Caution Light: Comes on if high temperature safety limit trips. Pre-Wired For Optional Room Thermostat: Heater shall include a 2-pole terminal block and is prewired to easily convert from the built-in thermostat to a wall mounted line voltage thermostat. 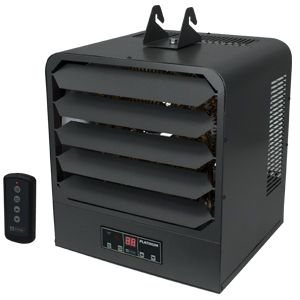 The heater can also be controlled by purchasing a transformer relay to operate a remote 24V wall thermostat. 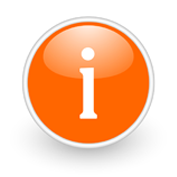 Refer to the installation instructions regarding the amperage requirements for use of both the line voltage thermostats and transformer relays. For 240V heaters use transformer relay model 24A01G-3 or RC840T-240/U. 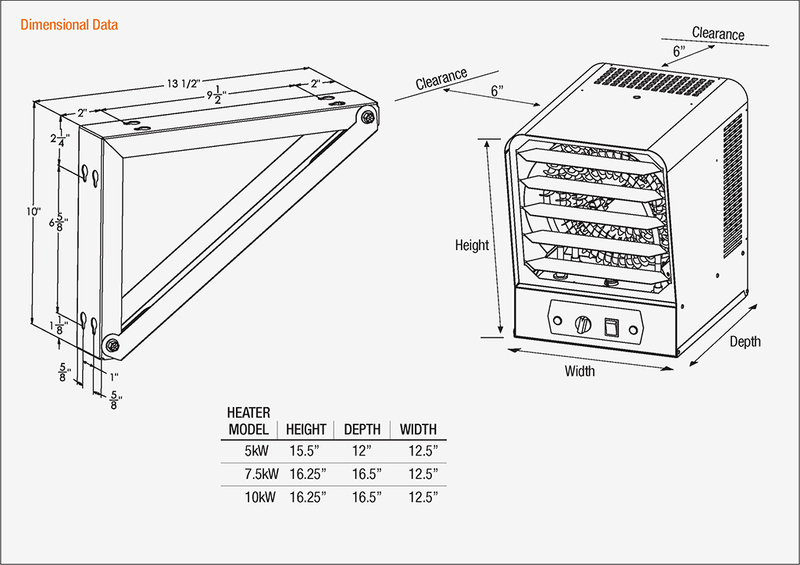 For 208V heaters use model 24A05E-1 or RC840T-240/U can be used on 7.5kW/10kW heaters.